While every Parsi household has their own way of cooking delicacies, there is one thing common – it’s their love and respect for food, which makes it taste heavenly. Parsi Mutton Kebabs are typically served as starters to the Dhansak Meals typically on a lazy weekend afternoon. But I can make and eat them with any meal and I am sure so will you because making them is so very easy. Don’t forget to add potatoes to the mince meat. Potatoes bind the meat and make the kebabs soft and succulent. Kabab, of which there are several distinct Persian varieties, is a national dish of Iran. Kebab may be served with either steamed, saffroned basmati or Persian rice or with Persian naan. Iran has more than seven types of kebab, which form a significant part of the Iranian diet. It is served with the basic Iranian meal accompaniments, in addition to grilled tomatoes on the side of the rice and butter on top of the rice. It is an old northern tradition (probably originating in Tehran) that a raw egg yolk should be placed on top of the rice as well, though this is strictly optional, and most restaurants will not serve the rice this way unless it is specifically requested. “Somagh”, powdered sumac, is also made available and its use varies based on tastes to a small dash on the rice or a heavy sprinkling on both rice and meat, particularly when used with red (beef/veal/lamb) meat. At Persian restaurants, the combination of one kabab barg and one kabab koobideh is typically called Soltani, meaning “sultan’s feast”. The traditional beverage of choice to accompany kebab is doogh, a sour yogurt drink with mint and salt. Take all the keema in a plate or a wide bowl and mix it with hands for about 3-4 minutes. Use a mortar and pestle to powder clove and cinnamon. Use the palms of your hand to make medium sized round balls of the keema-masala mixture, arrange them in a tray and refrigerate for about 15-20 minutes (or till you are ready to fry them). Coat the refrigerated cutlets in the egg mixture followed by breadcrumbs and deep fry in hot oil till they turn golden brown from all sides. 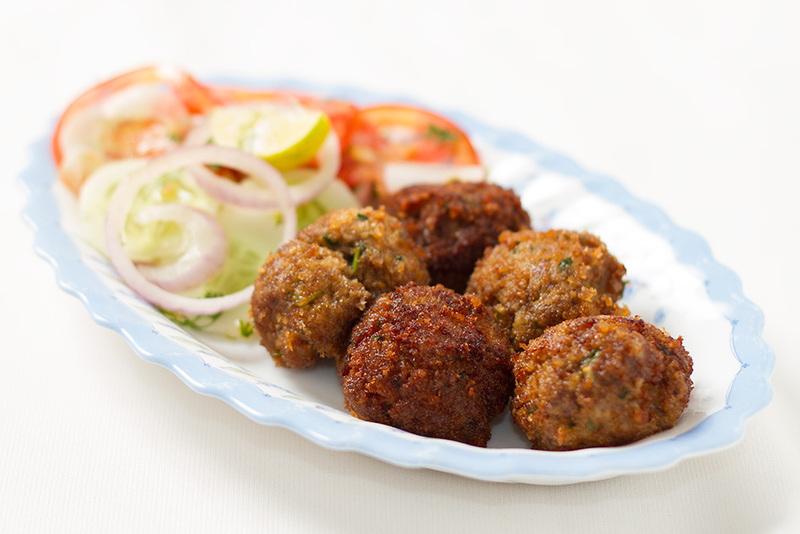 Serve these delectable mutton kebabs piping hot along with kachumbar and a slice of lemon.